Covering hundreds of miles of breathtaking scenery and embracing a variety of natural habitats, the Cornish coastline is second to none. The sheltered south coast is beloved for its tranquil estuary waters and gentler climes while the north coast feels the full force of the Atlantic and is often more rugged and sheer in appearance, an exhilarating contrast that makes for scintillating and dramatic coastal walks. Follow in the footsteps of smugglers and, legend has it, Jesus Christ himself, as you follow the coastal path between two pretty fishing villages on the south Cornish coast. The going is good to rugged, so be prepared for a few steep ascent and descents. Set off from the picturesque whitewashed fishing village of Polperro, heading east at the harbour to pick up the South West Coast Path. As you follow the path up the steep hill along the Warren, keep an eye out for Willy Wilcox’s cave, a Polperro smuggler who drowned whilst hiding from Customs Men. Although for centuries Polperro’s main industry was fishing, it became a lively smuggling port in the 18th and 19th century when alcohol, tobacco and tea were snuck ashore by moonlight. At the top of the cliff, you’ll notice a path dropping down to a lighthouse. This well-worn route is known as ‘Rueben’s Walk’, named after a harbourmaster who loved walking along the coast path and continued to do so when he lost his eyesight. Follow the coastal path past the war memorial and descend upon Talland Bay. Here you’ll find Talland’s ancient church, where, in the 18th century, the vicar (a renowned exorcist) was often seen leaping around the graveyard in the dead of night, cracking a whip over the headstones to ward off evil spirits, although it is rumoured that this moonlit performance was actually used as a distraction for the smugglers to bring their contraband ashore without being spotted. March onwards following the coast path above the bay towards Hore Point. Ahead, you’ll spot Looe Island (or St George’s Island). Local legend tells that Joseph of Arimathea landed on Looe Island with his great nephew in tow – a teenage Jesus – on their way to Glastonbury to found Christianity in Britain. Ignoring the footpaths heading inland, carry on along the coast to the rocky beach of Hannafore. Stop here to peer in the rockpools, home to scorpion spider crabs, hairy crabs, squat lobster and sea anemones. Continue as the road curves around to the harbour and the welcome sight of Looe‘s cafes, pubs and tea rooms for a well deserved drink. If your legs feel like lead, you can catch the bus from here back to Polperro. Walk the Devil’s Frying Pan to the trill of storm petrels, and onwards up stony cliff paths towards the crab creels and sea shanties of old Cadgwith. The undulating terrain of this walk can be challenging at times, but the fabulous coastal views make it well worth the effort. 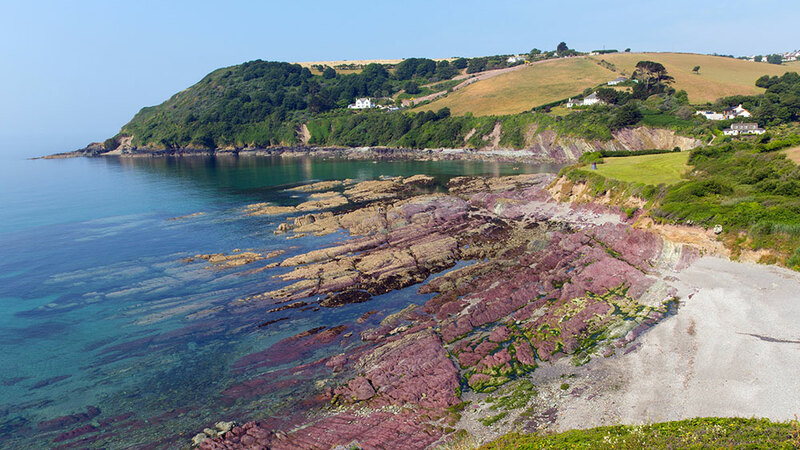 Pick up the South West Coast Path from Lizard Point and follow it eastward past Lizard Lighthouse – the British mainland’s most southerly spot – past the collapsed sea cave known as the Lion’s Den or the Devil’s Frying Pan, towards Housel Bay. Follow the sea cliffs round Pen Olver, Bass Point and the weathered white walls of the old Victorian signal station. Descend into Church Cove, named after the tiny church of St Wynwallow which lies close to the shoreline. Press onwards towards the charming fishing village of Cadgwith where you’ll find the catch of the day in pride of place on the pub menu. Climb the hill out of the village, passing old pilchard cellars, crab pot stacks and whitewashed, thatched cottages to follow the hedgerows back to whence you came, looping inland past the brewery at Trethvas Farm and St Ruan’s Sacred Spring. Set forth from Hell’s Mouth past the spitting blow hole and onwards to the golden shores of St Ives Bay where seals bob and the surfers drop in on the rollers. The terrain is fairly level along this breathtaking circular walk. Begin your walk from the dramatic rocky face known as Hell’s Mouth, forging your way past the mighty blowhole to Fishing Cove (a naturist haunt where the dingles sometimes dangle) and Castle Giver Cove (meaning ‘castle of the goats’). You’ll eventually reach The Knavocks, a cherished stretch of heathland that’s home to many species of birds and butterflies, and where wild ponies often graze. 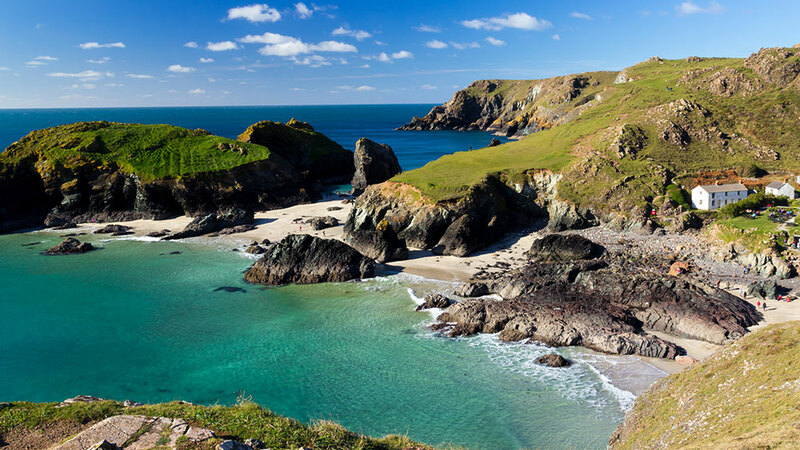 Re-join the coast path around the cliffs at stunning Kynance Cove. Next you’ll reach Mutton Cove, home of a large colony of grey seals (which should be admired from a respectful distance). With your best foot forward, you’ll reach Godrevy Head. On the distant outcrop stands the Godrevy Lighthouse, the inspiration for Virginia Woolf’s novel ‘To the Lighthouse’. You’ll also see the inviting sands of Godrevy Cove, a popular stage for surfers. With the sparkling waters of St Ives Bay to your west, continue along the path to the Godrevy Beach Café where you can stop for some refreshment. From here, you can either retrace your steps back along the Godrevy Heritage Coast or complete a circular walk by diverting inland. Cornwall’s rich mining heritage is etched along this dramatic stretch of coastline, from its iconic wheel houses perched on the cliffs to the scars of the quarries dug to build them. The Rinsey Head walk follows one of the gentler stretches – bar a steep descent – of the Cornish coastline between Porthleven and Prussia Cove on the coast of Mount’s Bay. From rare and exquisite butterflies to wheel house ruins, this is walk will have you captivated at every waymark. Pick up the coast path heading towards Hendra Beach. Stick to the path that hugs the coastline round Rinsey Head (home of Cornwall’s largest breeding colony of Kittiwakes) on your way to Trewavas Cliff. It’s here that you’ll encounter the Wheal Prosper Mine, a former engine house perched dramatically above Rinsey Cove and Porthcew Beach. 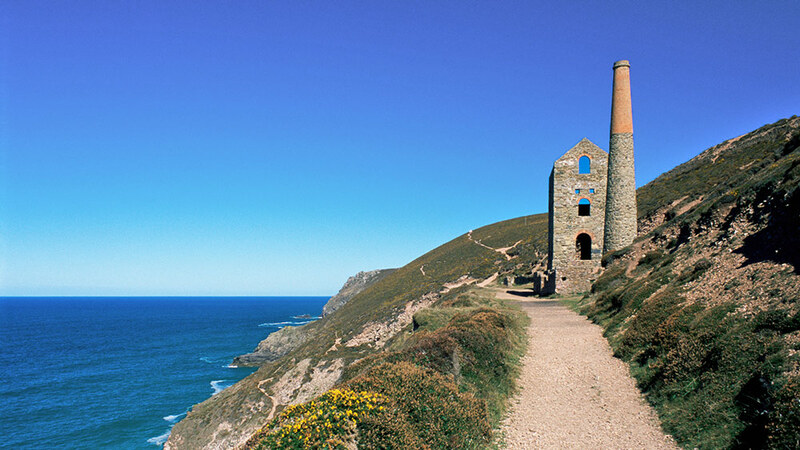 Built from slate (or ‘killas’) quarried from the nearby hillside and bolstered by granite quoins, the engine house chimney is one of the Cornish south coast’s most striking features, a reminder of the region’s rich mining heritage and a location used in BBC’s Poldark. Continue along the coast path and you’ll come across an area of marshland where wildlife thrives among vivid wildflowers, from great green bush-crickets and silver-studded blue butterflies, to wheatears, skylarks and song thrushes. Make your way around Trewavas Head en route to Camel Rock. Up ahead you’ll see the engine house ruins of Wheal Trewavas, a mine that once worked four copper lodes running below the seabed and employed 160 hardy souls between 1834 and 1846. Bear left inland, before doubling back to cross a field, setting yourself above the coastal path. Follow the waymarks through the fields then take the downhill track back to Praa Sands Car Park to complete the circuit. From the castle ruins, follow the curzy way walls along the sea-carved coast, admiring the unrivalled views and watching the seabirds before rounding the headlands to Boscastle. This is a vigorous but rewarding walk with a few steep climbs and undulations coupled with scintillating views at every waymark. Stroll down Tintagel high street, past the bowed roof of the beautiful old post office and the Kings Arthur’s Arms Inn, and head towards the castle ruins to pick up the coast path, travelling eastward to leave the flocks of Arthurian sightseers behind. 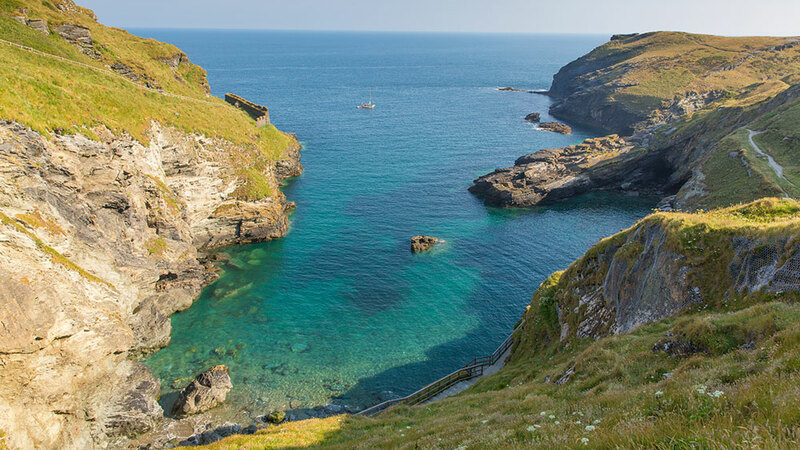 Follow the path to Barras Nose in the lee of Tintagel Island and feel free to stray if you want to admire the views of Tintagel Haven and Merlin’s Cave from this prominent headland. Stick to the coastal path around the cliff, ignoring Sanding Lane. Traversing the fringes of the Iron Age cliff castle at Willapark (an old Cornish word meaning ‘enclosure with a view’) it’s onwards past Lye Rock, a breeding site for a variety of birds including; peregrine falcons, razorbill, shag, kittiwake and fulmar (Lye Rock was once the site for the largest puffin colony in Cornwall). Descend the hill to cross the Rocky Valley bridge before passing the naturally formed rock arch known as Ladies Window. Further up the headland you’ll notice a sea-furrowed channel and the outcrop known as Short Island. Inland, you’ll see the Trevalga Church tower in the distance and a path leading up to the village which runs next to an old slate quarry works and the remnants of a horse whim used to winch both men and equipment up and down the cliff face. You might also notice the herringbone pattern in the old slate-stacked wall, or ‘curzy way’, that sets out the farmers’ boundaries and includes small gaps for livestock known locally as ‘sheep creeps’. Ignoring the inland track, continue along the coast path, passing the old slate works at Grower Gut. Across the valley, beyond California Quarry, yomp the ancient field strips on Forrabury Common, straying left towards the watchtower to enjoy sweeping headland views from Willapark; a place where the Revenue Men once lay in wait for smugglers. For your home leg, descend the coastal path and follow the riverbank to Boscastle harbour. If you’re planning a walking holiday in Cornwall, look no further than Toad Hall Cottages. We have hundreds of delightful Cornish holiday cottages and can provide you with the perfect base from which to set out and explore.